Weekend shoppers along Orchard Road, Singapore. The most livable cities in the region can be found primarily in New Zealand and Australia. Comparing their livability with their cost of living, most of these cities still do well. Actually, the leading cities Auckland and Wellington in New Zealand, and Sydney, Melbourne, Perth, Adelaide, Canberra, and Brisbane in Australia hardly lose or gain in the ranking. This means that it is still comparatively affordable for residents to live in these cities and to access their abundant amenities and livability features. More interesting is a group of cities in position 10 to 20 in the cost-weighed livability ranking. Here many cities rise up the ranks, when their comparatively lower cost of living is included in the livability ranking. This puts cities such as Colombo (Sri Lanka); Bangalore, Chennai, Kolkata, and New Delhi in India; the Indonesian capital Jakarta; and Yerevan (Armenia) into the top 20 for Asia. While I would not argue that these cities are necessarily highly livable, the cost-weighed ranking of the cities shows us that some places among the ‘second row’ of livable cities offer their amenities and livable features under more affordable conditions. In contrast, the group of cities that lose most in a cost-weighed livability ranking include Tokyo (Japan), Seoul (Republic of Korea), Shanghai (People’s Republic of China), Singapore, and Hong Kong. 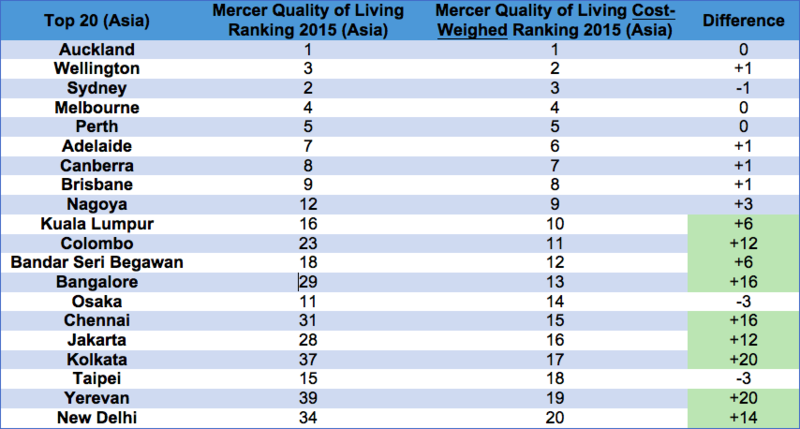 While they are ranked among the top 20 most livable cities in the region, their comparatively high cost of living gives them a significant disadvantage compared to other Asian cities. A recently launched ADB publication defined livability as combining a sustainable environment with economic competitiveness and social equity; the last one is crucial for us. A city with a lower cost of living might not be beneficial to its residents if, for instance, good schools and reliable hospitals are not widely available. On the other side, a city with better schools and high-quality hospitals is not of much use if a majority of residents cannot afford these services. Similarly, a city full of parks may seem more livable, but it is possible most of those parks are located in exclusive neighborhoods far away or fenced off from the general public. Hence, it may be a ‘livable’ city, but only for the elite – this runs against the idea of a livable city that is also inclusive. When we talk about livable cities, we cannot assume every citizen can easily pay for services or amenities. Instead, we must study how livability can be made broadly accessible and affordable to most residents. Even Tokyo, Seoul, or Singapore, which are ranked very low in the above calculation exercise, are actually examples of how inclusive urban development, despite high cost of living, can make a city livable.